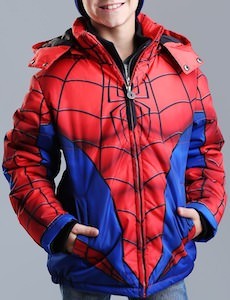 If your child loves Spider-Man and needs a new winter jacket then this kids Spider-Man jacket is what you like to see. The puffy winter jacket looks a lot like the outfit Spider-Man wears only a lot more puffy and warm and it the hood comes off so that you can adjust it for the weather. Inside the jacket there is a media pocket and and ID label so that with your child’s name in it you don’t have to worry about them loosing it. And the Spider-Man jacket has a water repellent treatment so that it keeps the water out and it is available in kids sizes 4 – 14. If you want a cool leather jacket then you have to check out his Harley Quinn leather jacket. 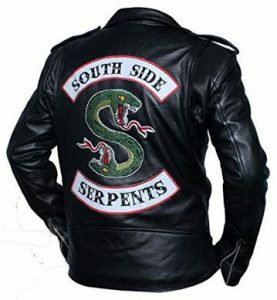 The women’s jacket is made from 100% leather and comes in women’s sizes XSmall – 3XL. The jacket is based on Harley Quinn like we have seen her in Suicide Squad. The back of the jacket says “Daddy’s Lil Monster” and besides that the outside shows some stitch marks on the white, red and black leather. Inside the jacket you can find Harley Quinn art to take up most of the back of the leather jacket and it does have a inside pocket too. If you are looking for a cool superhero jacket then you should check out this Wonder Woman leather jacket. And no the jacket is not made from real leather so no animals were hurt for making the jacket. 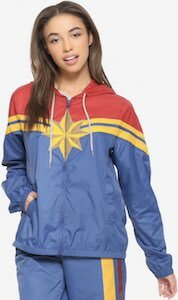 You can get the Wonder Woman jacket in women’s junior sizes XSmall – 3XL. 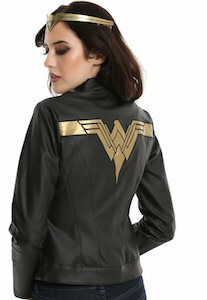 The Wonder Woman jacket is mainly just a black faux leather jacket but on the back there you will find a big gold Wonder Woman logo so that everyone will know that there is Wonder Woman power close to you. It is a motorbike style jacket and it is one of those items you keep going back to as it looks so stunning. 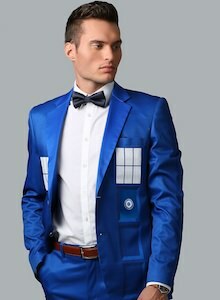 If you are a Doctor Who fan that is looking for a nice suit then check out this formal Tardis suit jacket. The Jacket is just amazing and really is for the true fans. The jacket is Tardis blue with the windows on it and the door sign and inside the lining of the jacket shows the inside of the Tardis. Just click on the image to see other images of the jacket. And to make it complete they even added a nice bow tie and you can get Matching Pants too. 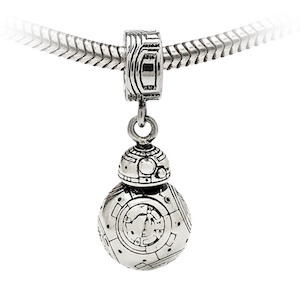 And you can get this Doctor Who suit in many sizes for the perfect fit. 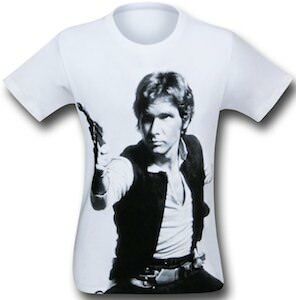 Now you can look amazing as a suit every day of the year or you can wear this as part of a cosplay or Halloween costume. Now there is a pink Power Rangers moto jacket that is perfect for women that would love a cool jacket. The jacket looks like a leather motorcycle jacket but it actually made from polyester so no animals were harmed to make the jacket. The jacket is pink with black sleeves with on the front a big golden signature emblem. The jacket has gold colored zippers and buttons that just look amazing and yes the jacket has pockets too so that you can look extra cool. Cosplay or every day this Power Ranger moto jacket is what you want and it is available in women’s junior sizes XSmall – 3XL. The unique story of Finn. Started out as a Stormtrooper for the First Order, but after deciding to flee and leave for good he began to actually fight against them. 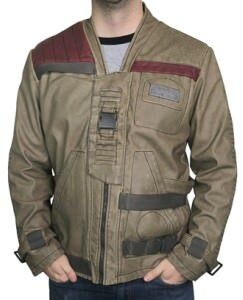 This replica jacket looks just like the one Finn wears in the awesome action packed movie Star Wars: The Force Awakens. With all of the unique features from the red patches to the different sized utility pockets and of course the buckle on the front center chest. Made to be very durable from a faux leather material of 100% polyurethane outer shell that will look amazing and last you a long time. 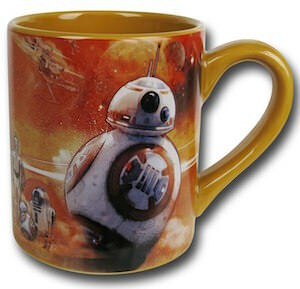 The inner lining is made from 100% cotton giving you a super soft and comfortable feel while also sturdy and durable. Newt Scamander is the big star of the Fantastic Beasts and Where to Find Them movie and now you can dress like him thanks to this New Scamander coat. The coat is perfect for cosplay or Halloween costume and it is great as a coat to wear every day of the year too. The coat looks exactly like the one Newt wears and even has an inside wand pocket. It’s just a piece you are going to love. Made from a wool blend this Fantastic Beasts and Where to Find Them coat is just what you need and it is available in men’s sizes XSmall – 3XL. 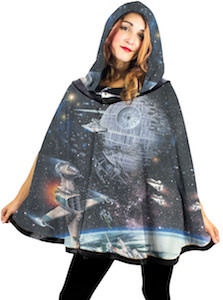 If you are a Star Wars that wants a poncho then you are in luck as now there is this Star Wars reversible poncho. 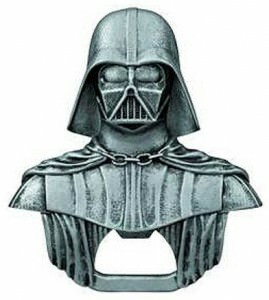 The outside of this poncho can be plain black or show a space battle with the Deathstar and many more space crafts. 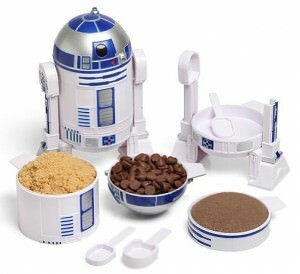 And that gives you options for a plain look or show the world how much you like Star Wars look. 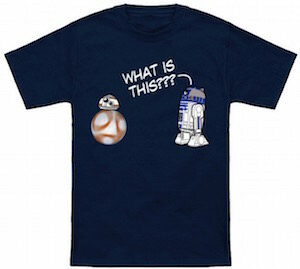 You can get this Star Wars jacket in sizes Small – 2XL and yes it does have a hood. The poncho is made from 95% polyester and 5% spandex and it has a button close and slids for the arms.